My advice to young aspiring kickers and punters can be summed up with what I like to call the 3 P's: Patience, Persistence and Perseverance. When learning the skills that are necessary to become a quality kicker or punter, you may go through periods where you struggle with your progress. Learning how to kick and punt takes PATIENCE. Whenever I went through these difficult periods, I was tempted to do one of two things: either continue to practice that same day until I got it right or become frustrated and stop trying altogether. Thank goodness I never chose to stop trying! But I did choose to continue kicking more on the same day a few times and learned real quickly that that was not the answer either. By continuing to practice more during the same session, I found that my leg started to tire to the point that I was beginning to develop even more bad habits by improperly using my body to compensate for my fatigued leg strength. After learning the hard way, I began to develop a PATIENT approach towards my development and that played an integral part in my ascent to the professional level. The second P is PERSISTENCE. What set me apart from the rest of the competition starting at the high school level was that I considered my kicking and punting aspirations to be a 365-day a year task. When each season ended, I dedicated myself to improving my leg strength in the weight room to make improved strides for the next season. I also made sure that I kicked and punted on a regular basis in the off season to stay sharp. Just like any job or career, if you stop practicing for 5 to 6 months straight, you will regress and be forced to work twice as hard just to get back to where you were the previous season. A good personal example was my progress in high school. I worked extremely hard in the weight room to improve my leg strength and it showed in my games through my increased distance on kicks. In 9th grade, I kicked a 36-yard field goal. 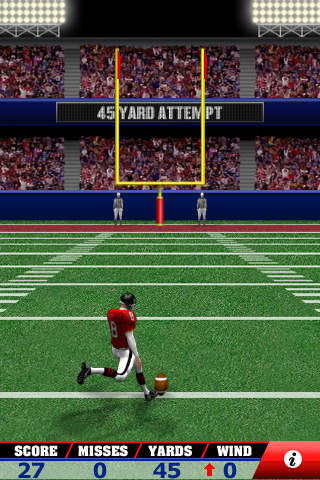 In 10th grade, I kicked a 42-yard field goal. In 11th grade, I kicked a 52-yard field goal. And in 12th grade, I kicked a 51 and 53-yard field goal. The final P is PERSEVERANCE. Throughout my career, I have been met by difficult challenges that threatened my opportunities to kick and punt. In 10th grade, I broke my kicking foot during a punting drill right before we were to play in the Florida state playoffs and it was devastating setback. I had to work twice as hard that off season to improve because I had to rehabilitate before I could move forward. Needless to say, I was up to the task and finished a successful high school career and earned a full scholarship to Stanford University . However, that was not my last obstacle to overcome. My freshman season at Stanford was a very difficult time for me. Although I was 42-42 on PATs, I only connected on 7-18 field goals. I hit one of those slumps that I just couldn't seem to get out of and the coaching staff had lost their confidence in me, which made it even more difficult. It was such a bad slump that Stanford recruited another kicker and that was my last season as the full time placekicker. My sophomore season was spent as solely the kickoff specialist. Although I sincerely felt that I was good enough to still placekick, I held on tightly to the one job that I could perform for the team, which was kicking off. Realizing that my opportunity to placekick was probably gone for a while, I dedicated myself to improving my punting skills. The punting job was going to be open for my junior season, and I focused on winning that job. I worked harder than I have ever worked before to win the job, and when the time came to perform, I made the most of it. I finished my junior and senior seasons as the starting punter and kickoff specialist, averaging 41.5 yards per punt for my career and being selected to the All Pac-10 Conference team. My persistence also paid off when the kicker that took over for me went into a slump. The head coach called on my number to kick in the final three games of my career. I had not kicked in a college game over 30 games, but I was ready when needed. I made all 7 of my PAT attempts and made my only field goal attempt. There is one major detail that I left out of this story. In between my junior and senior season at Stanford, I tore my ACL in my kicking leg, which required reconstructive knee surgery. I beat the odds by rehabilitating my knee in time for the first game of my senior season. That was 5 months after my surgery, and ACL surgery rehabilitation usually takes at least 8 months. In closing, I hope that you were able to learn some valuable lessons about how to apply the 3 P's to your development as a kicker and punter. You must remember that no "P" works by itself. You must apply all three in unison and you will be prepared for just about any obstacle that gets in your way. I am available via e-mail anytime you have a question or would like some positive encouragement about making the 3 P's a part of your work ethic. After receiving reconstructive knee surgery in 1994, Aaron was invited to participate in the annual NFL Combines in Indianapolis in 1995. From there, Aaron was signed by the San Jose Sabercats of the Arena Football League. In 1995, he played an integral part in San Jose 's road to the Western Division title. In 1996, Aaron set an Arena League record by making a 63-yard field goal against the Florida Bobcats. His 63-yard field goal also tied the NFL record. Aaron retired from kicking after the 1996 season to pursue a career in Real Estate while continuing to work with aspiring kickers and punters. Aaron was a four-year varsity letterman at Stanford University from 1990-1994. During his college career, Aaron handled placekicking, punting and kickoff duties. He finished his career a perfect 50-50 on PATs, with over 90 touchbacks on kickoffs. As a punter, Aaron led the Pac-10 in 1993 with a 42.2 yard average and was named to the All-Conference First Team.